From the June 2016 Desktop News | Drs. Gregory Starr and Christina Staudhammer, professors in the Department of Biological Sciences, along with collaborators from Florida International University and the U.S. Department of Agriculture-Forest Service recently received $834,000 from the National Science Foundation to continue their study of greenhouse gases in the Everglades. They will specifically look at how changes in fresh- and sea-water levels are affecting the balance of carbon-dioxide and methane emissions in the Everglades. And methane emissions in the area are also changing—potentially contributing to climate change and global warming. Their ongoing project, which began nearly nine years ago, allows them to pinpoint the various ways that urbanization, conservation, the increase of salt water intrusion, and changes in precipitation are influencing the balance of greenhouse gases by taking detailed measurements across the Everglades. 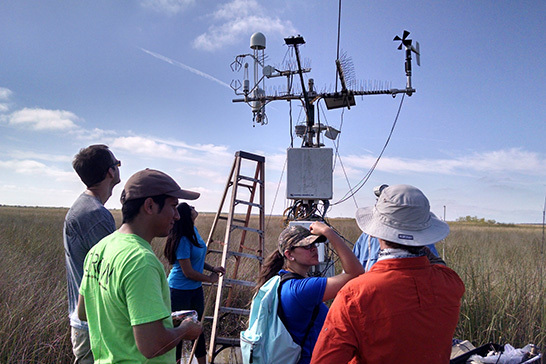 Prior to their newest NSF grant, the team had two research sites in the Everglades. The additional funds will enable them to set up two more sites, covering four major ecosystems in the area—coastal mangroves, freshwater marshes that have standing water six months of the year, freshwater marshes that have standing water the entire year, and an area called the brackish zone—where freshwater and salt water meet. The equipment at each site continuously monitors nearly 40 variables in the ecosystems—from temperature and water level to precipitation and concentrations of carbon dioxide and methane. Then it records that information 10 times each second. The data is condensed into 30-minute increments for Staudhammer, the statistician on the project, to analyze. In total, she looks at 17,520 observations from each site each year—making 70,080 measurements a year. An important part of Staudhammer’s role is estimating uncertainty in the observations, which is challenging because of the high frequency of collection. Once the data is analyzed, Starr says the readings will have major implications for policies and current conservation efforts like the 30-year, $10.5 billion Comprehensive Everglades Restoration Plan. The data will allow them to understand not only what is creating the greatest increase in greenhouse gases, but it will also show them how well current conservation efforts are working—and whether or not they are repairing or further damaging the environment. Looking to the future, they also expect that the data will enable them to make more accurate projections for what the Everglade systems will look like 50 to 100 years from now through computer simulations.